Stand the mango on your cutting board stem end down and hold. Place your knife about 1/4" from the widest center line and cut down through the mango. Flip the mango around and repeat this cut on the other side. 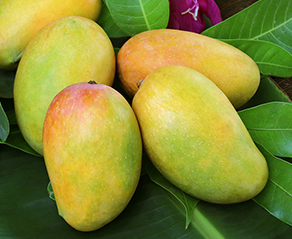 The resulting ovals of mango flesh are known as the "cheeks". What's left in the middle is mostly the mango seed. Cut parallel slices into the mango flesh, being careful not to cut through the skin. Scoop the mango slices out of the mango skin using a large spoon. Cut parallel slices into the mango flesh, being careful not to cut through the skin. Turn the mango cheek 1/4 rotation and cut another set of parallel slices to make a checkerboard pattern. Scrape the mango chunks off of the skin, using a knife or a spoon. Stand the mango on your cutting board stem end down and hold. Center the Mango Splitter above the mango, with the opening in the splitter aligned with the widest part of the mango. 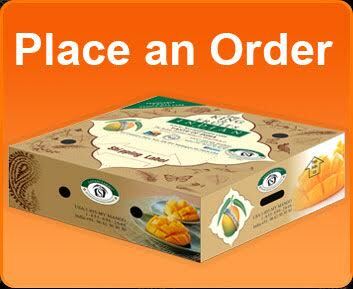 Use the "Slice and Scoop" or the "Inside Out" methods shown above to separate the mango flesh from the skin in cubes, dices or slices. 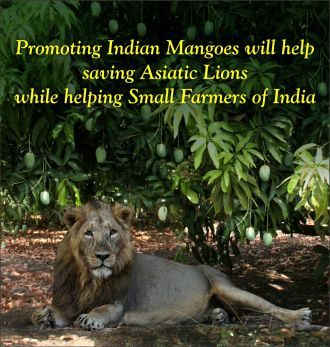 The mango splitter can be purchased at stores that sell kitchen accessories or online.